This is THE truck that would finally put minitrucks on the map in the automotive world. We all know that the minitruck crowd is innovative and creative, but it is true that we’ve never really been given the credit where credit is due. 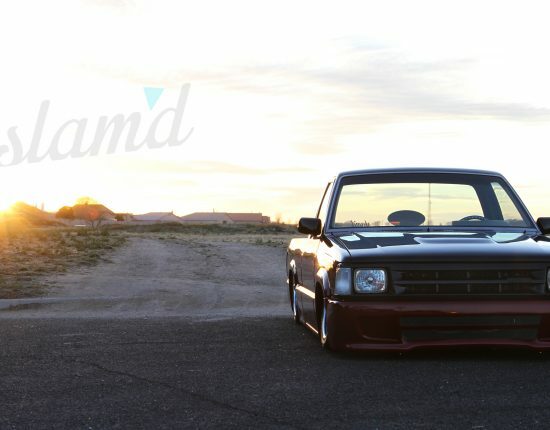 We were the first ones to push and develop quality air suspension setups and components, to make the “bodydrop” a mainstream mod, and so much more – yet other automotive genres (particularly the hot rod and custom world) still tend to look down on most of today’s minitruck builds. 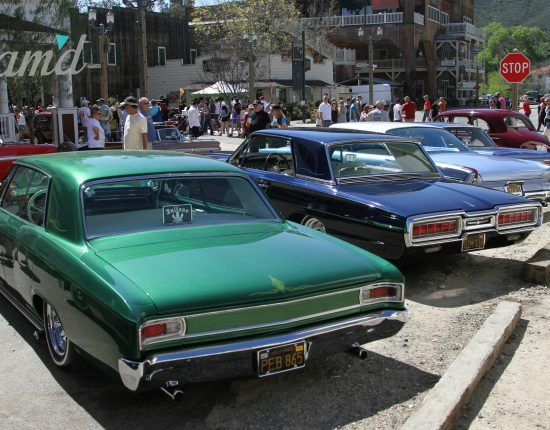 But Pascal pushed to break the mold and build a high-quality minitruck that could compete with any street rod out there on their terms and at their shows. Enlisting the crew at Little Shop and Recovery Room, they set out to turn a 2000 Ford Ranger into a true work of art, and as you can see – they succeeded! Mini Truckers have a reputation amongst older car guys of being hacks, if you don’t believe me, just ask an old hot rodder. They’ll be more than happy to tell you. With that being said when a minitruck is built to the caliber that Pascal, The LIttle Shop and Recovery Room put together, it commands attention from anyone that appreciates a properly built vehicle. To this day it remains the only minitruck to be published in The Goodguys Gazette and if that doesn’t tell you everything you need to know then I don’t know what else will. With so many sick rides already featured here at Slam’d, especially in the truck category, choosing which truck got my vote for the Truck of the Year Award was extremely difficult. 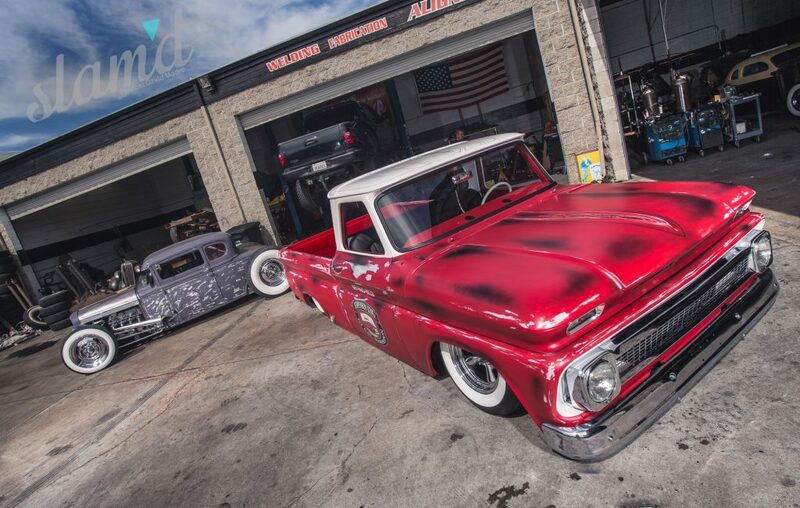 Like so many awesome builds, Mike’s C10 was built out of pure passion and love for the automotive scene. But with years of work put into it and many obstacles traversed to finally finish it, this truck holds a value much greater than some built in a matter of months by someone merely looking to have a nice show vehicle. 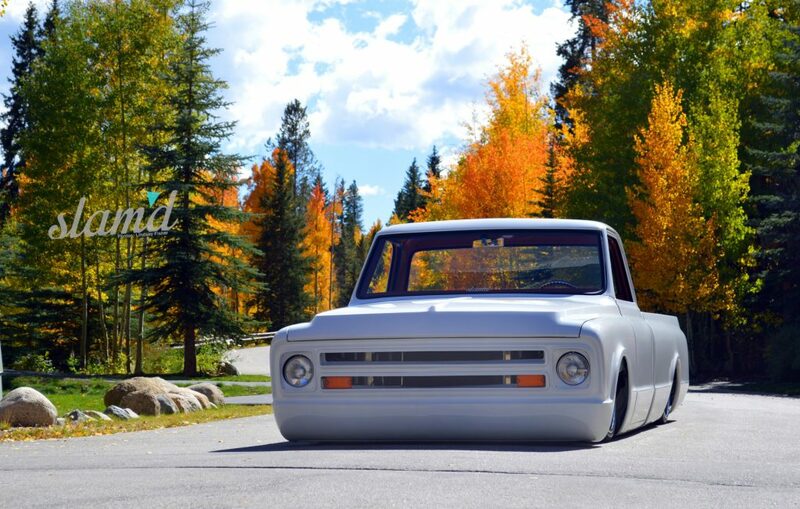 This truck the product of the most dedicated attention to detail that I’ve ever seen, but it also has custom mods galore, like the full electric remote tilt-forward hood, custom airbrushed woodgrain bed with LED back-lighting and a completely shaved smooth body. 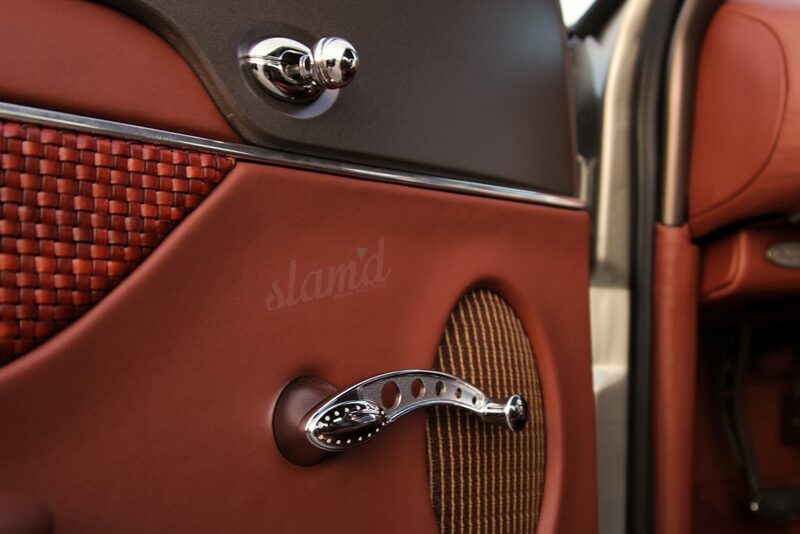 A single suicide door for a unique “pass-through” look into the interior adds to the truck’s one-of-a-kind design, along with the custom Porsche Terracotta Leather upholstery, and Porsche Cayenne gauge cluster. Built to drive and show, this truck is the ultimate combination of utility, award-winning show quality and exotic sports car luxury, and we couldn’t ask for more in a Truck of the Year contender! I may be just a bit bias with this one, but you can’t disagree that this vehicle is insane from headlight to taillight and everything in between. It functions as a drift car and is as detailed as any show truck ever built. Not to mention it was built by hand by the owner/driver and proves that anything is possible if you put your mind to it. Seeing this thing scream around a track in person just sealed the deal for me on this one. There were so many great trucks featured in Slam’d for 2014, but for me the Truck of the Year would be Nigel Petrie’s Toyota Hilux. 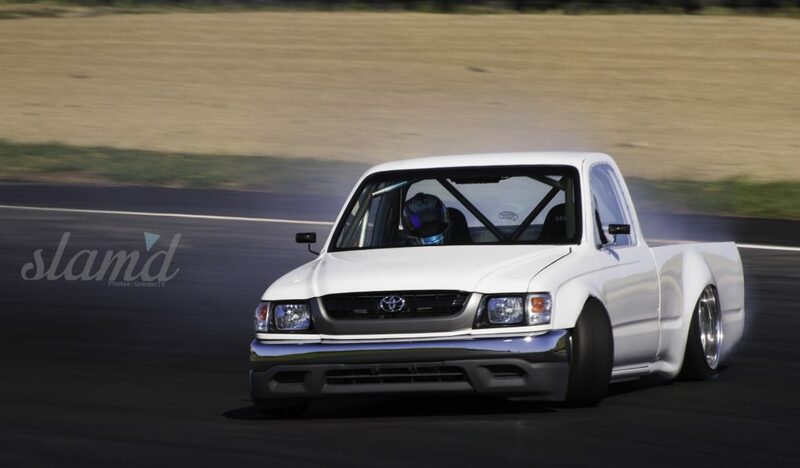 His love for the minitruck and drift scene truly shows in this Engineered To Slide Hilux. Seeing this thing going sideways at 100+ mph would bring a smile to everyone’s faces. This one-off Hilux is built from the ground up by the owner and that is one of my main reasons for choosing him for the “Truck of the Year” awards. It is simply an amazing build that started as a vision and became something that I could only wish to create. 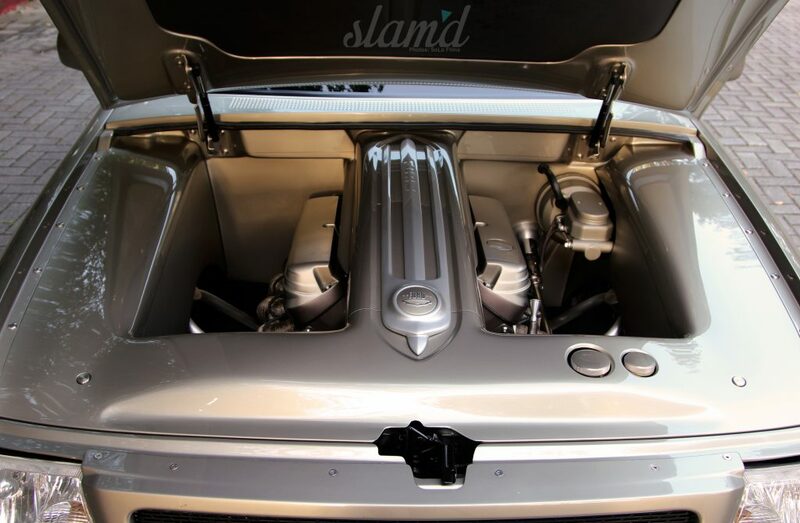 Nigel encourages everyone to “Dream It, Build It, Drive It” and that definitely rings true for us here at Slam’d Mag. This truck embodies everything that I believe the minitruck scene currently has to offer. Long gone are the days of the “that’ll do” mentality to get a truck on the ground. In today’s automotive culture it’s about taking a vehicle, making it look amazing, and 100% functional. Trucks are now able to go the distance and look good doing it. Little Shop and many others are on the forefront, putting out top quality, hot rod inspired rides such as this Ranger masterpiece. 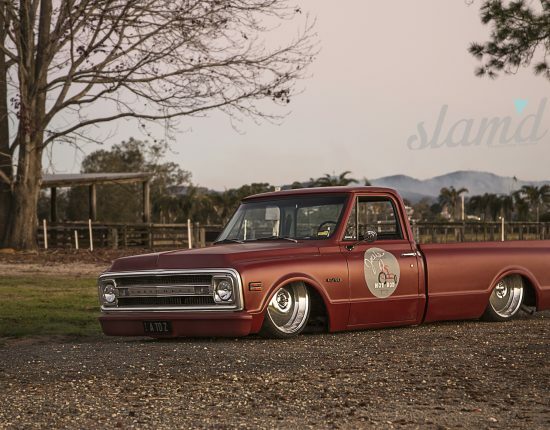 My vote for the Slam’d 2014 Truck of the Year would have to be Pascal Barone’s The Stranger built by The Little Shop. It has all the key ingredients; the perfect stance and wheel combo, extremely clean exterior with immense amounts of unnoticeable mods, and an interior to die for. A stellar quality truck from front to back with immense amounts of detail throughout. 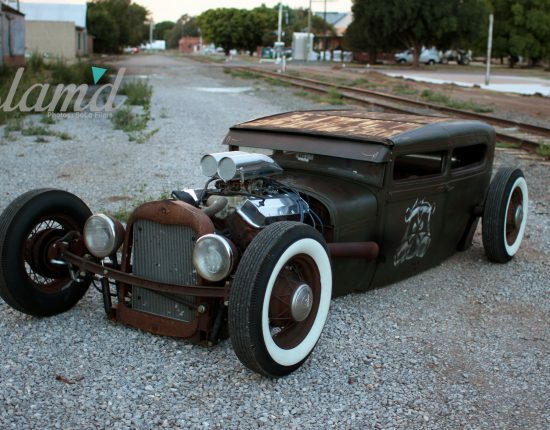 Definitely a top build and one to bridge the gap between minitrucks and hot rods. I’m a huge fan of all C10 trucks, but particularly the 60-66 shortbeds. I came up on this shop truck in Vegas last month at SEMA and every step closer I got, I became more and more in love with it. There are definitely people out there that hate any version of the patina look, whether real or done with the use of paint, but I am not one of them. 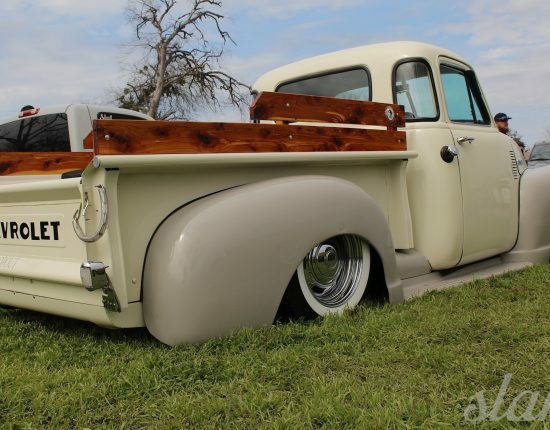 My next truck will be similar to this build, something that might look rough around the edges, but is done right and has a ton of character underneath the skin. The whitewalls look great on there and carrying the white through the grille, roof, and bedfloor makes it all work together really well. Eric and the crew at So Cal Suspension did a badass job on this one, just like all of their past builds. I can definitely see this thing being put to use and accruing tons of miles on parts runs, daily driving, and long hauls to shows. Truck of the Year, yes I know I’m a bit bias on this one, but come on! I guess I love the Misfits Metro for a lot of reasons, firstly this was my very first feature for Slam’d Mag, something that I’ve wanted to achieve for a long time now was establishing myself with a creative automotive publishing outlet and really flex my muscles and learn as much as I could under the guidance of the extraordinary talent like we have here. The Misfits club treated me like family from the get-go and took me for a wild ride during the few days I spent with them. Their camaraderie and friendship is what being in any club is all about and for these guys it’s an automotive life that they live and breathe every single day and it’s very cool to witness and be a small part of. 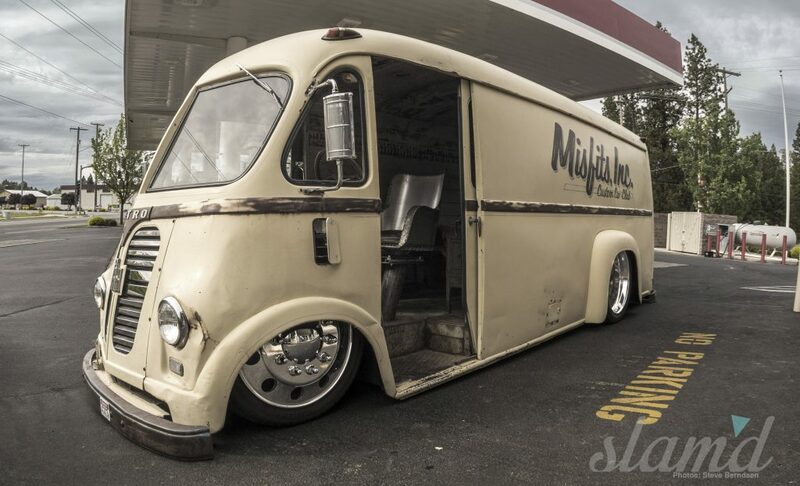 Lastly, the van itself just commands respect, ‘bagged dually van on 24-inch alcoas, I mean if that doesn’t make you stiff then you’re reading the wrong magazine here. To me this van represents what everything our lifestyle is about; badass rides, camaraderie, beers and good times! What can I say that hasn’t already been said? The title says it all: Masterpiece. Pascal has finally received his long awaited recognition for one of the baddest minitrucks ever built, hands down. 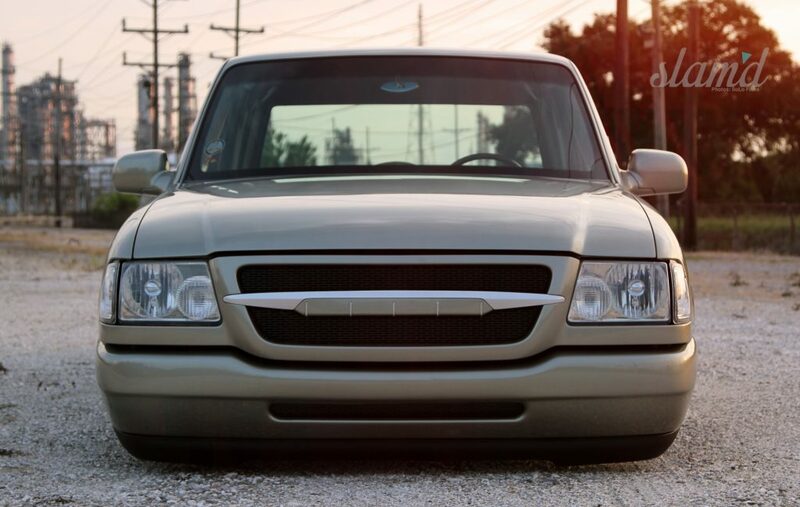 This truck is truly a work of art that deserves its place in minitruck history. For Truck of the Year, I had to go with Nigel Petrie’s Toyota Hilux. The choice of vehicle is important, as well as the insurance that is critical for any vehicle. From cars to Lorries, you may want to look into one sure insurance, who have a variety of insurance policies to help keep you and your vehicle covered from anything that may happen. You might also be interested in checking out something like this best truck tool box, as this is something that you can then take with you everywhere and it will sit nicely in your car. Although you might want to just get the insurance sorted first before you look into buying any extras for your truck. Obviously this tool box is suited for more traditional trucks. However, what’s not to love about Nigel Petrie’s Toyota Hilux? This is a build that continues to amaze me no matter how many times I come across pictures or videos of it because of the pure craftsmanship that Nigel put into this build. Every day we see build threads with guys swapping out parts but how many times do you see someone build a vehicle from scratch. That alone makes this truck stand out for me even though the other nominees are also amazing creations. But come on now, sideways at 90+ mph – hell yes! So for those counting on their fingers and toes, the winner of the 2014 Slam’d Mag Truck of the Year goes to The Stranger; Pascal’s Masterpiece! A huge congrats to Pascal Barone, The Little Shop crew, Recovery Room, and everyone who had a hand in bringing this masterpiece to life!